Warning: Major Spoilers. If you haven’t seen the film and plan to… you may want to read only beneath the embedded video. 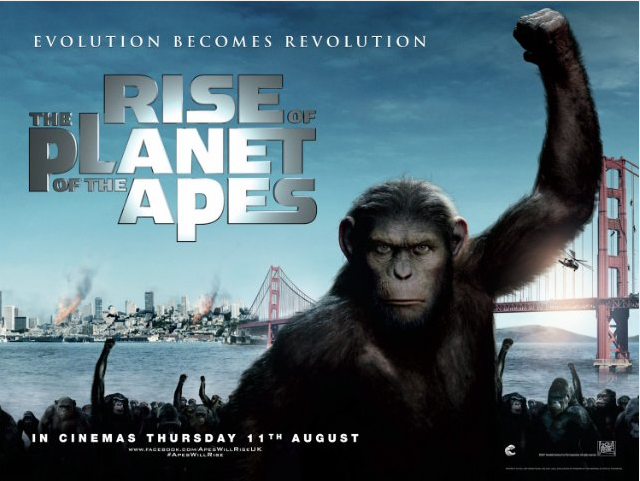 Grossing $54 million (and counting) during its debut weekend, Rise of the Planet of the Apes is well on its way to becoming a summer blockbuster. 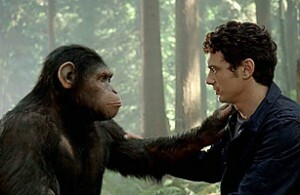 But the star of the film is not James Franco, in spite of top billing.Â It is actually the genetically modified, cognitively enhanced chimpanzee, Caesar — marvelously acted by Andy Serkis (you may remember him as the CGI-character Gollum in Peter Jackson’s Lord of the Rings trilogy).Â The emotional range and realism of Serkis’ Caesar shows how much CGI has matured. And Serkis is likely to receive an Oscar nod for his performance. Anyone not familiar with the well-known Planet of the Apes franchise (and Charleton Heston’s famous line â€œGet your paws off me, you damn, dirty ape.â€ from 1968’s Planet of the Apes) likely does not own a TV set or have Internet access. The line, it turns out, is used again the 2011 reboot: rather than Heston’s human character getting hosed down in the chimp-run laboratory (read prison) of the original film, it is Caesar who gets hosed by a redneck keeper in a modern-day research facility looking more like an Abu Ghraib for chimps. But Rise of the Planet of the Apes is much more than just the reboot of a famous franchise, digitally updated for the Avatar generation.Â It highlights the plight of chimpanzees in the wild, the human-like abilities of the great apes, the realistic possibility of an Alzheimer’s cure, and the equally realistic possibly of human pandemics resulting from genetic experimentation. The film opens with a scene of a troop of chimps in the wild, reminiscent of the many National Geographic specials on Dr. Jane Goodall’s famous Gombe Stream Chimpanzee Reserve in Tanzania. We are reminded of wild chimpanzee origins and their sophisticated social abilities.Â The tranquility of the marching troop is quickly shattered, as economic reality comes into play and the chimps are brutally captured by African locals for sale as research subjects. Transition to the offices of the pharmaceutical company, GynSys, where James Franco plays a San Francisco researcher searching for a cure for Alzheimer’s, which afflicts his dad (John Lithgow). Will is testing his drug delivery vehicle, a virus, on chimps.Â Will ends up adopting a baby chimp whose cognitively-enhanced mother was exposed to the Alzheimer’s drug. Will’s dad names him â€œCaesar,â€ and the little chimp quickly shows human-level intelligence as he masters his environment and solves difficult puzzles (this is the fun part of the movie). When Caesar nearly kills a neighbor, he is sent to the local animal shelter, where the chief (Brian Cox) tells Will that the chimp will be kept in an open-area play structure and gradually reintroduced to the other chimps at the facility. Instead, Caesar is shoved in a fetid cage and mercilessly teased by his jailer (Tom Felton).Â With one its many nods to the original franchise, we are fleetingly introduced to a young Cornelius, the chimp archaeologist (played by Roddy McDowall in the original 1968 movie). There are some fun twists and turns during the final escape sequence over San Francisco’s Golden Gate bridge, which is executed by chimp leader Caesar with strategy and tactical deployment almost worthy of namesake Julius Caesar marching on Rome. Credit goes to Rupert Wyatt, director of the 2008 prison thriller The Escapist, for non-stop action and some lip-biting sequences. But beyond the drama, some serious transhumanist themes emerge: among them, chimp research (and animal rights in general), the use of pharmaceutical cognitive enhancers, evolution, and the possibility of a cure for Alzheimer’s. Chimps, along with their (and our) cousins — the gorillas, bonobos, and orangutans — are endangered species.Â According to the Save the Chimps website, chimps continue to be used for biomedical research today.Â The use of chimps in such research has began to see a decline, although their use as models for hepatitis C research continued to interest scientists. Over the past decade there has been a modest decline in the estimated number of chimps living in research laboratories, from 1500 to 1100, largely attributed to the transfer of chimps from labs to sanctuaries. Bruce Katz, Chief AI Scientist at ColdLight Solutions, suggests that cognitive enhancement is a kind of evolution, but not in a traditional sense, â€œbecause with cognitive enhancement we will be taking the first significant steps towards being a self-modifying system.â€ He points out that ordinary evolution develops at a glacial pace, and it is not at all clear that evolution can take us much beyond where we already are â€œin the smarts department.â€ Could/should chimps possibly evolve in this manner? Slate Magazine points out that cognitive enhancers are already used off-label by people looking for a little cognitive lift: stimulants for ADD/ADHD treatment, like Ritalin and Adderall, and the anti-narcoleptic drug Provigil (modafinil). And some Alzheimer’s treatments, like Aricept (donepezil), may also help boost memory in people without dementia: “It’s not clear that they’re really cognitive enhancers for healthy people,”Â said Hank Greely, a Stanford professor who studies law and the biosciences. “The evidence is mixed. And if they do helpÂ they don’t seem to help very much. It’s not like [the movie] Limitless; they’re not turning into Superman.” A wonder drug like ALZ-112 in the Rise of the Planet of the Apes simply does not exist yet. 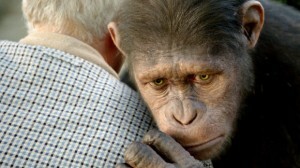 Putting aside the heady issues of cognitive neuroenhancers, evolution, Alzheimer’s cures, and chimp research, it is ultimately Andy Serkis’ Caesar, a product of special effects and motion-capture, that carries the film.Â You’re never quite sure exactly where the human ends (and perhaps the character is a little too eerily human) and the effects begin, but Serkis aka Caesar gives the best performance in a movie with lots of fun sequences and some real science at its core. R.U. Sirius brings you ACCELER8OR. Use us as your thoroughfare for accelerating technoculture & screaming memes, with a side order of strangeness and charm. Read articles and interviews which illuminate the New Edge culture. Warning:This site may contain unlabelled irreverence and subtle playfulness. Humorless and hypersensitive people should proceed with caution. Dirk on Shocking Shocker! Alex Jones & David Icke Are Illuminati Disinfo Agents! Leonardo Rubino on The Latest from CERN: Did Einstein Blunder? Hosting and themeing provided by Ian Monroe.